I like to support the talented local artists and it is good that the rules state the market is only for New Zealand Arts and Crafts. Last week I bought a woolly hat from a lady who has a farm around here and knits up the wool from her own sheep. It is great to get some fresh food and produce that it is locally grown. I like the Hawea Honey. Local eggs, local fruit and vegetables. 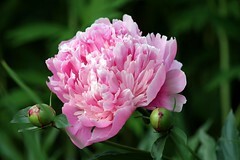 Can’t resist a big bunch of peonies that grow so brilliantly in Otago. http://www.WanakaFarmersMarket.org.nz is the web site for more info.